Food Forward is so excited to host Tara Whitsitt of Fermentation on Wheels at our North Hollywood headquarters for a book chat, bus tour, and hands-on fermentation workshop! Fermentation on Wheels –the book and the adventure– was born in Oregon’s Willamette Valley in May 2013 when artist Tara Whitsitt converted a forty-foot vintage military bus into a fermentation lab and workshop. Since then, she’s travelled over 24,000 miles with a mission to bridge communities, inspire sustainability, and teach fermentation. With her new illustrated memoir/cookbook, Fermentation on Wheels, Tara shares road stories and delectable fermentation recipes learned and created while on the road. Tara and her bus will visit The Fruit Cave (Food Forward’s warehouse headquarters) for an afternoon of CULTURE — and you’re invited! Together, we’ll discover the simple process and rich tradition of fermentation. You’ll go home knowing how to creatively and fearlessly ferment vegetables with this hands-on workshop. After the book talk and workshop, you’re also invited onto the bus for tours, tastings, and further fermentation talk! Bring starter cultures — sourdough, kombucha SCOBY’s, water kefir, and more — of your own for exchange and discussion. Free admission is available with advance RSVP, and we recommended a $10-$15 donation day-of to support Fermentation on Wheels. You can also purchase your copy of Fermentation on Wheels in advance from Food Forward via Eventbrite, and get it signed by Tara after the workshop! 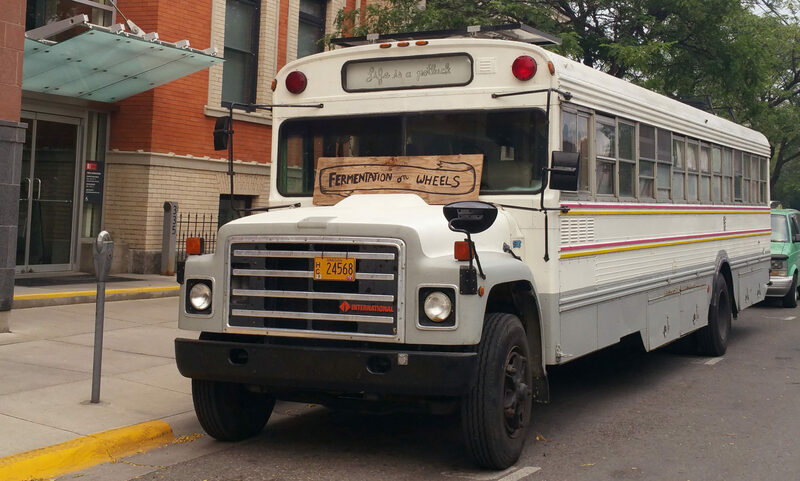 – A $10-15 donation is suggested to support Fermentation on Wheels. – If you’d like to take a starter culture home with you, please bring something to trade or an additional donation of $10 (per starter culture). Ferment a little further….Our friends from Fort Point Beer Company are generously providing beer gratis to our 21+ attendees!